(CNN) -- A roadside bomb attack Thursday in the Somali capital, Mogadishu, injured the nation's interior minister and killed one of his secretaries, according to a source close to the minister. 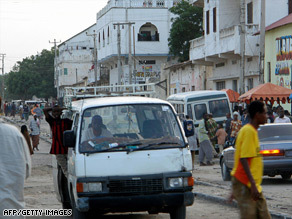 The Bakaraha market in Somalia's capital is one of the most dangerous areas of the city. The mid-day attack on Abdukadir Ali Omar, a member of the transitional government, left him with shrapnel wounds to his leg. The extent of his injuries was unclear, said the source, who requested anonymity because he is not allowed to speak to the media. The explosion occurred about noon at the Bakaraha market, in one of the most dangerous areas of the city. The interior minister is a popular moderate who led assaults against Ethiopian forces during their invasion of Somalia. Ethiopian troops invaded the country at its request in December 2006. The Ethiopian invasion ousted the Islamic Courts Union, an Islamic movement that had claimed control of Mogadishu earlier that year. Thursday's attack on Ali Omar fueled concerns that moderate Islamists would strike out against the hardline Al-Shabab, which is suspected in the explosion. Al-Shabab -- which the United States has designated a terror organization -- warmly welcomed a recent call for the overthrow of Sheikh Sharif Sheikh Ahmed, Somalia's new president. The call, delivered via an audio recording, purportedly came from al Qaeda leader Osama bin Laden. -- Journalist Mohamed Amin Adow contributed to this report.